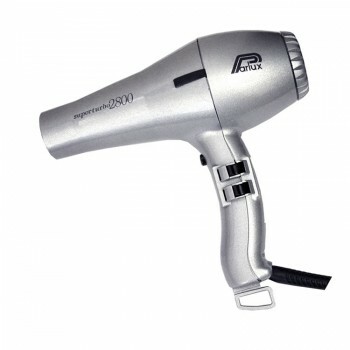 The Parlux 2800 hairdryer is amongst the fastest dryers on the UK market. It has a 1760 watt output and airflow of 50 litres per second. Because of this power, the dryer is equipped with 2 nozzles, one for fast drying - the other for styling, which makes the Parlux 2800 hairdryer extremely popular amongst professionals. These Parlux hairdryers have an ergonomically shaped handle providing an extremely comfortable working position and perfectly balanced weight distribution. The 2800 hairdryer is fitted with an extended 3-metre cable and long life motor, as is standard in all professional Parlux hairdryers. · Powerful 1760 watt professional hair dryer motor. · Parlux 2800 hairdryers are available in black and silver.